I’ve received a bunch of recipe inquiries about the salad we gobbled up during our last Family Dinner. And I can’t blame ya because it was DEE-LISH! My niece and seester prepared the dish using Ina Garten’s recipe for a Middle Eastern Vegetable Salad and it was a WINNER! 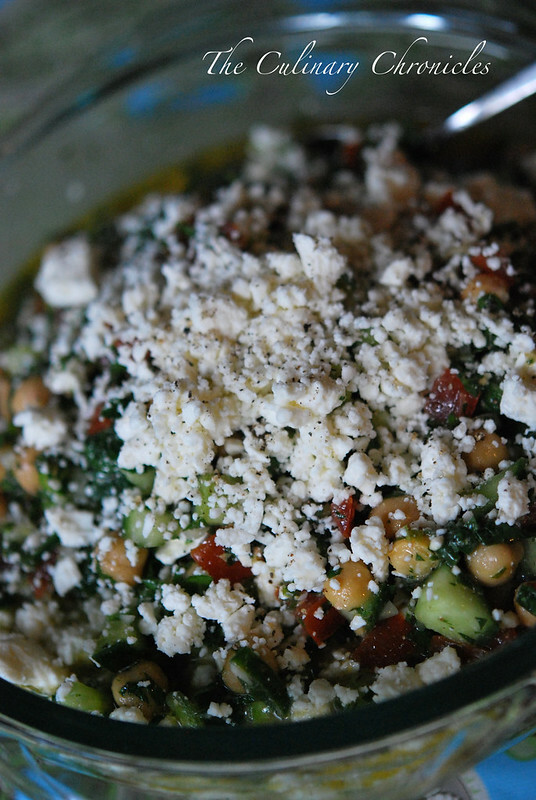 It packed a huge punch of flavor from the abundance of herbs, feta cheese and citrus. It was extremely bright and would be a fab dish to enjoy on a warm day with a glass of pinot grigio and chunk of freshly baked bread. MMMMM! We didn’t have fresh basil on hand and ended up omitting it. Truth be told, I didn’t really miss it—but I’m sure it would be wonderful with it. Oh that Ina…..she knocks it out of the park—AGAIN! Think she needs a new bestie in the form of a quirky Vietnamese gal? In a small bowl or measuring cup, whisk together the lemon juice, garlic, 2 teaspoons salt, and 1 teaspoon pepper. Slowly whisk in the olive oil to make an emulsion. Pour the dressing over the salad, tossing gently to coat all the vegetables. 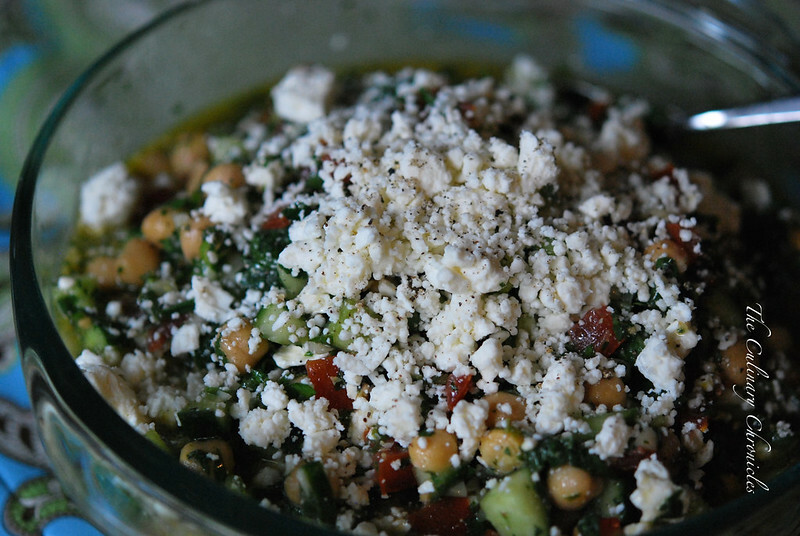 Add the feta, sprinkle with salt and pepper, and toss gently. More times than not, I’ve got a lot to say about everything. And when it comes to food– fuggedaboutit! But then there are times when I take a bite of something and there are really just no words needed. 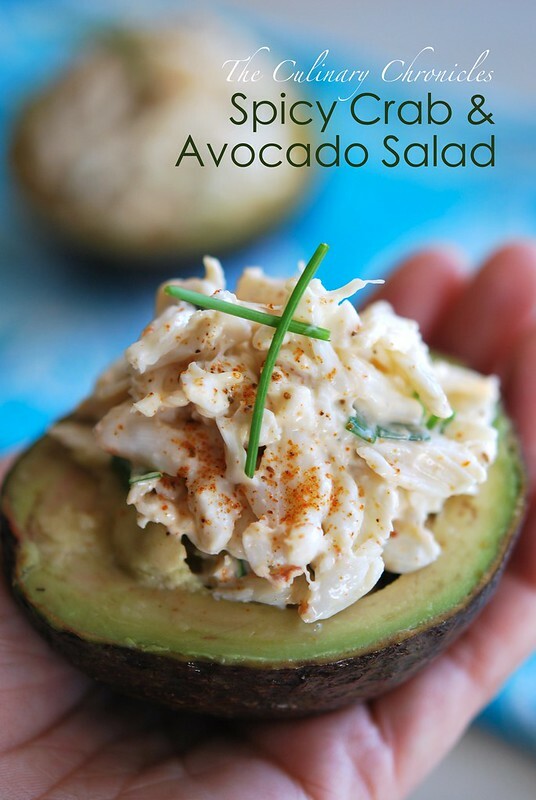 Like with this Spicy Crab and Avocado Salad. MMMMMMM!!!!!! 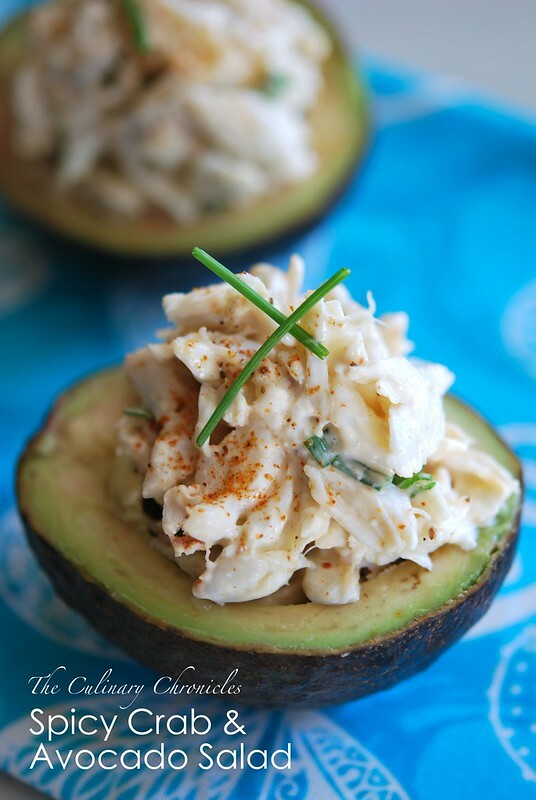 TONS of sweet lump crab meat, paired with the creaminess of avocado, a slight crunch from the serranos and a kick of spice. Perfection! Okay, okay. Maybe I do have a few words but trust me, one bite and you’ll know exactly what I mean. In a bowl, gently combine the crab, scallion, serrano pepper, mayonnaise, hot sauce, lime juice and Old Bay Seasonings. Taste and season with additional salt and pepper. Refrigerate the crab mixture for 30 minutes. Spoon half of the crab mixture into each of the avocado halves. Sprinkle with a dash of Old Bay Seasonings and top with chives. Enjoy! 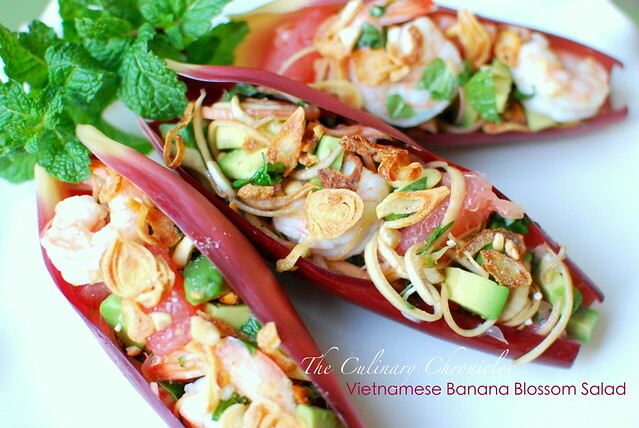 Gỏi Bắp Chuối (Vietnamese Banana Blossom Salad) & Giveaway Winner! Gỏi is a general term for “salads” in Vietnamese and can come in all forms using a variety of ingredients. 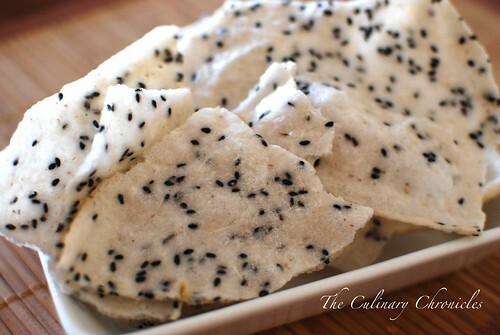 Lately, my favorite Gỏi utilizes thinly sliced Banana Blossoms. I combine it with grilled proteins, pink grapefruit, creamy avocados, a ton of herbs and a healthy douse of Nước chấm “vinaigrette”. 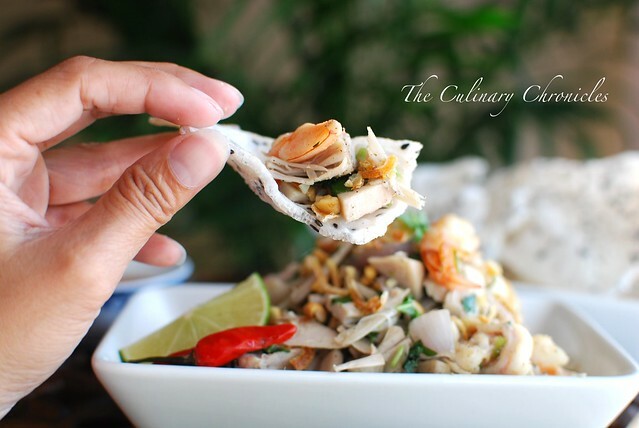 It’s absolutely delicious and epitomizes the balance in Vietnamese cuisines. 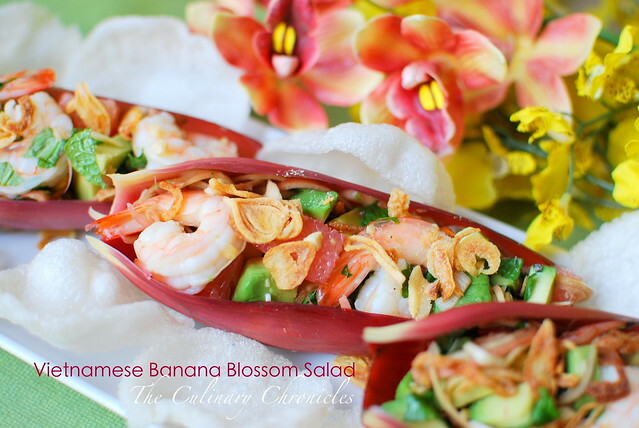 If you’ve never used Banana Blossoms before, they can be somewhat tricky the first time around. It’s best to remove the outer few petals as they’re quite tough (though you can save them as garnish), use a really sharp knife so you can get thin slices, and be sure to soak the cut blossoms in cold water that has been mixed with some type of acid–citrus juice or vinegar does the trick. The later helps removes some of that chalky flavor that the Banana Blossoms can sometimes have. And although it sounds a bit laborious—it’s totally worth it and delicious! CONGRATS Serena Kim who said she would serve Shrimp Pesto Pasta in the Nambé Bowl. Sounds yummy and will look gorgeous in your new bowl! Serena, we’ll be sending you an email shortly so we can get your new Nambé artwork shipped out. THANK YOU to everyone who participated! And THANK YOU Nambé ! Prepare the sauce. In a medium sized bowl, stir the sugar and water together until completely dissolved. Add the remaining sauce ingredients and stir until combined. Set aside. Fill a large bowl with cold water and add the rice wine vinegar. Peel off the dark colored and tough outer leaves of the banana blossom. Use a sharp knife or mandolin to julienne the blossoms. You can either discard the “baby bananas” or chop them up finely. Submerge the banana blossoms into the bowl of water/vinegar after they have been julienne. Allow the banana blossoms to sit in the vinegar water for 15-20 minutes. In a large bowl, add the shredded chicken, prawns, avocados, herbs, and freshly cracked black pepper. Add a few spoonfuls of the sauce until the items are lightly coated. Drain the banana blossoms from the vinegar water and squeeze out any excess liquids. Add banana blossoms to the other ingredients and spoon in some additional sauce. Gently toss the salad with the fried shallots and plate. Sprinkle the top with crushed peanuts and serve. It’s been unusually warm these past few weeks — not your typical fall weather at all. Not that I’m really complaining but it does make me turn to lighter dishes instead of slaving away in a hot kitchen. 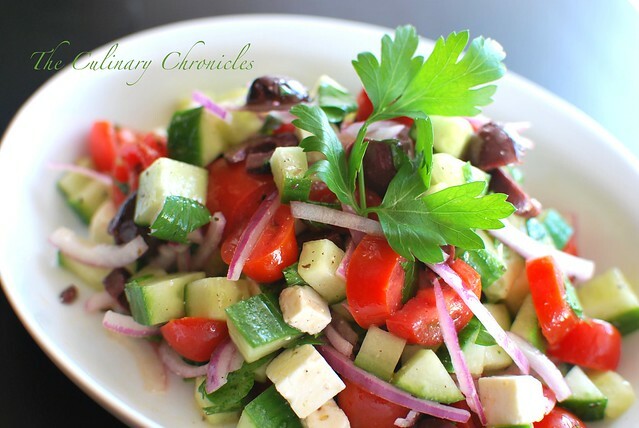 The other day I picked up a bunch of produce at my weekly farmer’s market and decided to make a refreshing Greek Salad for lunch. 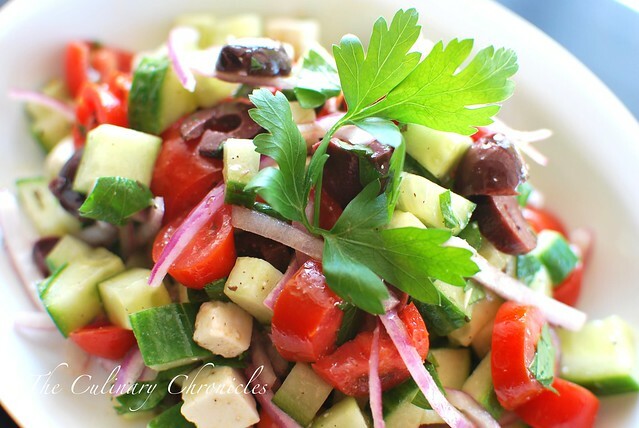 The salad is full of bright flavors from the fresh veggies, feta and the olives. Delish! And the leftovers were the perfect accompaniment to the Spanakopita I made the next day. Up next, flaky and buttery Spanakopita! In a small bowl, combine vinegar, garlic, and oregano. Slowly whisk in the olive oil until emulsified. Season with salt and pepper. In a large bowl combine the rest of the ingredients. 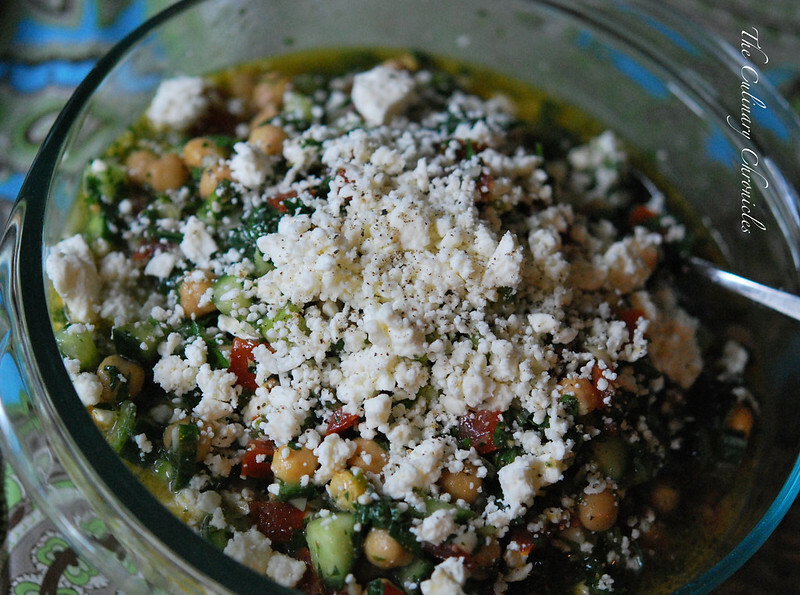 Drizzle dressing over salad, and toss to coat. When our clan gathers, you can be sure that there will be a massive array of delicious food. One can always count on the usual favorites such as Bánh Ít (sticky rice dumplings), Bún Bò Huế (spicy beef noodle soup),and Cua Rang Muối (salt roasted crab). And intermixed with all the Vietnamese goodies would often be a sprinkling of “American” dishes such as mom’s Turkey. Growing up, each dish became linked to one of the aunties or Mom as they each refined the recipes to make it their own. But as my generation grew older, the proverbial baton was passed and we in turn began to make these iconic family favorites. And I find comfort in knowing that these dishes that my siblings, cousins, and I create will pass on my family’s traditions through food. It’s kind of remarkable to think that the Phở Gà I’ll make for my kids will be exactly the same recipe my mom would have made for them. One dish that I hope to continue is Gỏi Mít Trộn. At the heart of the salad is Mít Non—young, unripe jackfruit. The flesh of the young jackfruit is tender and mild in flavor. In the states, Mít Non is sold both canned and frozen. However, if you use the frozen type, you’ll need to boil it for a bit. After being washed and well drained, the Mít is stir fried for a few moments before it’s tossed with shrimp, pork and several herbs like Rau Răm (Vietnamese Cilantro). 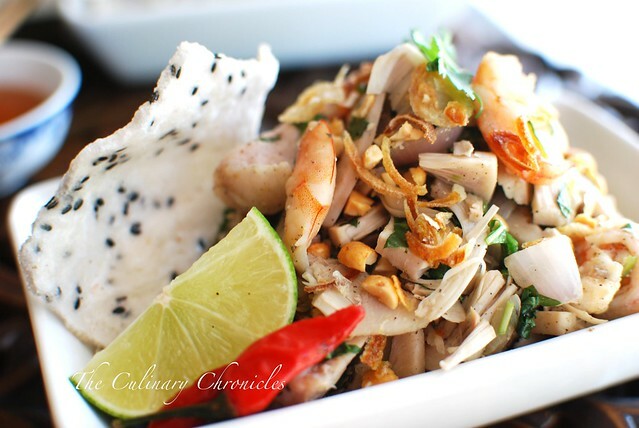 The Gỏi Mít Trộn is then topped with fried shallots, crushed peanuts and accompanied with nước chấm (dipping sauce). I like to eat Gỏi Mít Trộn by drizzling nước chấm with lots of chili on top of the salad with a healthy squeeze of fresh lime juice. Then I take a piece of the Bánh Đa and use it to scoop up the goodness. YUM! The layers of flavor and textures in this Gỏi really rock it out. Extremely savory from the proteins and fish sauce with bright herbaceous notes from the Rau Răm, mint, and cilantro. With each bite you get a lovely crunch from the rice crackers and peanuts that balances so well with the tender Mít. If done correctly, everything is in perfect harmony. 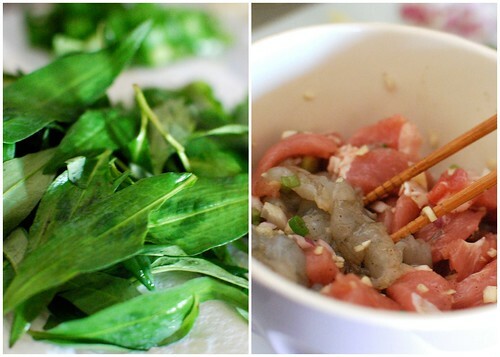 In a large bowl, combine shrimp, pork, ½ tablespoon garlic, 1 tablespoon shallots, and a few dashes of fish sauce. Mix and season with black pepper. Allow to marinate for 10 minutes. Drain the cans of jackfruit. Remove any seeds (including the shell layer surrounding the seeds) and cut off and discard any hard sections. With a sharp knife, thinly slice the jackfruit and transfer to a large bowl that has been filled with cold water. Repeat until all the jackfruit has been cut and rinsed. Using clean dishcloths, gently squeeze out the excess liquid. If too much moisture is left, your salad will be really wet and mushy. 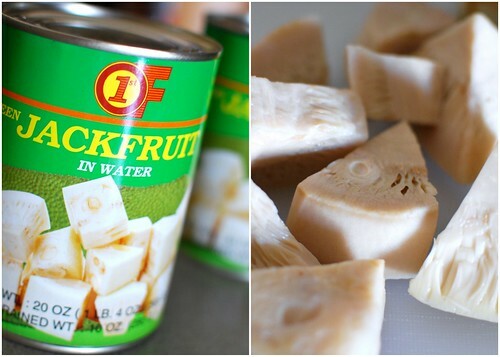 Set the jackfruit aside. In a large skillet, heat 2 tablespoons of vegetable oil over a medium flame. Add pork and shrimp and sauté until cooked, about 4-5 minutes. Remove from the pan and set aside. Using the same skillet, add another 1 tablespoon of oil over a medium flame. Add the remaining shallots, half the scallions and sauté until softened before adding the rest of the garlic. Stir and sauté for 2 minutes. Add the jackfruit and remaining scallions and sauté for an additional 2-3 minutes before seasoning with a few dashes of fish sauce and black pepper. Remove from heat and mix in the shrimp and pork. Toss in the Rau Răm, mint, and cilantro. Taste and adjust accordingly, keeping in mind that additional Nước chấm will be used. Plate the contents to a large dish. Sprinkle the tops with fried shallots and crushed peanuts. Serve the Gỏi Mít Trộn with Bánh Đa, Nước chấm, limes, and chilies. Enjoy! Growing up, our mom never measured her ingredients out. It was a toss of this, a pinch of that…..taste, adjust, and a few more shakes of whatever just for kicks. And even when she was coerced into documenting her dishes, they were vague amounts such as a “1/2 rice bowl of sugar” and a “handful of garlic”. Everything was “to taste”. It made it difficult as heck to learn her “recipes” but I soon realized all of our aunties were like that too. And that’s what I’ve come to believe Vietnamese cooking to be. It’s pretty tricky as it’s all “to taste” and highly subjective. You’ll find this quandary even more prominent in “simple” dishes as one slight off-balanced proportion will throw your taste buds for a spin. Things like nước chấm, soups, and even salads will have you repeatedly tasting and adjusting for the perfect balance. Thịt Gà Bóp Rau Răm, is a perfect example of this challenge and was a staple in our household growing up. 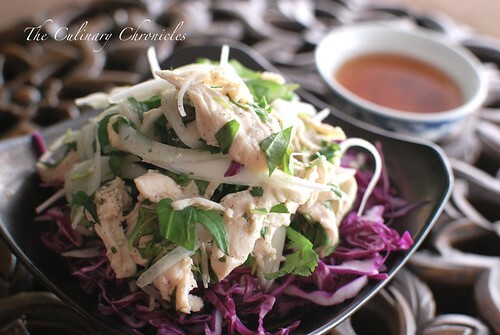 Popularized from the Huế region of Viet Nam, shredded poached chicken is tossed in a light vinaigrette and packed FULL of fresh herbs and thinly sliced onions. And although I’ve given some measurements in the recipe below, it really depends on your flavor palette to add as much or as little lemon juice and sugar or salt and pepper. Just keep in mind that it’s also served with the nước chấm dipping sauce so you’ll need to adjust accordingly. With all that said, the rau răm (known as Vietnamese Cilantro or Vietnamese Coriander) is my favorite part of the dish. The uniquely bright and slightly peppery flavor this herb adds is something that is difficult to describe but must be experienced. In fact, I’d say that it’s my favorite herb, closely followed by fresh cilantro and Thai basil. The addition of the shredded red cabbage is my nod to the restaurant, Hue Rendezvous in Westminster, California. They serve their Gà Bóp on top of shredded green cabbage, which I think is such a great addition for the added crunch and texture. This time around, I chose to use red cabbage because it’s a little milder in flavor and because its beautiful color provided such a striking contrast. Thoroughly wash and clean the chicken. I usually lightly scrub several tablespoons of table salt all over the exterior body/interior cavity of the chicken and rub cut lemon wedges over the skin. This acts as a type of “exfoliant” and helps to reduce impurities and grit as the chicken is poaching. Trim any excess fat and skin as well as be sure to remove the bag of giblets and neck. Rinse the chicken well with cool water and pat dry with paper towels. Prick the skin of the chicken all over with the tines of a fork. Bring a large pot of water to a boil. Add the nước mắm, ginger, garlic cloves, and pepper corns. Gently ease the chicken into the pot and lower the heat to an even simmer. Poach until cooked—about 25-30 minutes. (Skim off any impurities that may form and discard.) Carefully remove the chicken from the pot and cool to room temperature. *At this point, the poaching liquids can be strained and stored to be used as a light chicken broth at another time. While the chicken is cooling, combine the sliced onions and rice vinegar in a small bowl. Toss to cover thoroughly and allow to sit for about 15 minutes. In another small bowl, dissolve the sugar into the lime juice. When the chicken is cooled enough to handle, shred all the meat into bite sized pieces discarding the skin, bones, and fatty portions. Toss the shredded chicken with the pickled onions and add in the rau răm and cilantro. Add the lime juice mixture a little bit at a time to your taste preference. Season with salt and pepper. 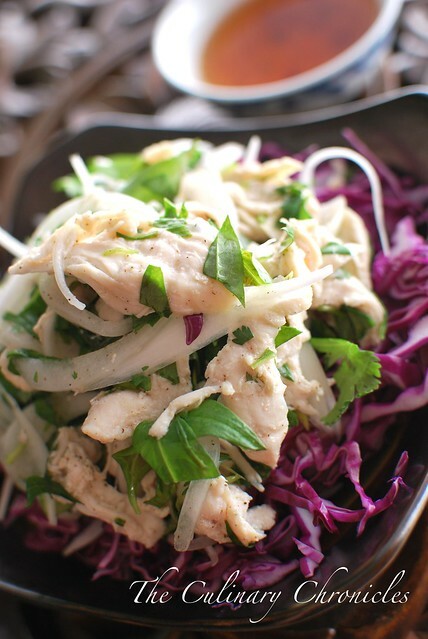 To plate, spread the shredded cabbage on a large plate and top with a pile of the shredded chicken salad. 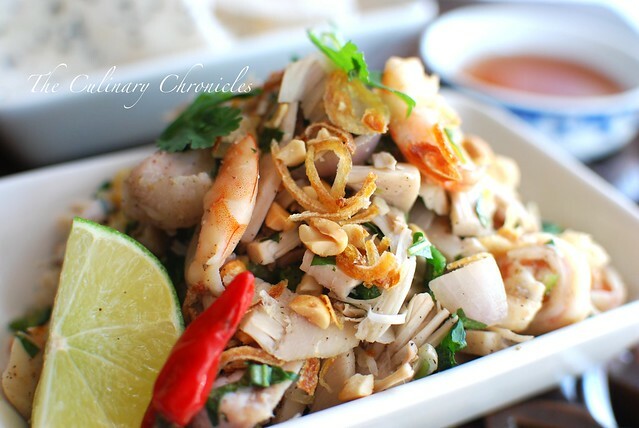 Sprinkle the tops with fried shallots, chilies, crushed peanuts and serve with nước chấm on the side. *It should be noted that Gà Đi Bộ (free range chicken) is preferred in this dish for its texture and flavor. Before joining our extending family for dinner and presents on Christmas Eve, the siblings (sibs-in-laws, kids, and 4-legged furry kids) gathered for lunch. The menu included Peach Bellini Cocktails, Cosmopolitan Martinis, Lemon Bars, Red Velvet Cupcakes, Rosemary Bread, Pear and Gorgonzola Salad, and a decadent Seafood Cioppino in honor of our Mom. I thought this Asian Pear and Gorgonzola Salad would be a nice compliment to our lunch spread—-plus the green and red colors added a lovely festive touch. When I initially thought of making it, I had intended to use Bosc or Bartlett Pears. But when we had some juicy Asian Pears on hand, my sister suggested that they would be a nice alternative. You’ll also find that most pear salads will have walnuts in them. But since walnuts are my least favorite nuts, I swapped them out for one of my favorites—pistachios. Yum. I think the end results was a bright dish that had great texture balance from the crunch of the pomegranates and pistachios to the creamy and slightly piquant flavor from the gorgonzola to the verdant essence from the greens. As for the Pomegranate Vinaigrette, it brought together all of the components without overpowering them. Would our Mom have enjoyed the meal? I have no doubt she would have loved it. Prepare Vinaigrette. In a small sauce pan or skillet, heat olive oil on low. Add shallots and cook until softened—about 2-3 minutes. Remove from heat and cool. Place pomegranate seeds in a small bowl. Using a fork, crush the seeds to allow the juices to come out. Add shallots, sugar, and red wine vinegar. Slowly whisk in the olive oil from the shallots until fully incorporated. Season with salt and pepper to taste. Arrange the greens onto a large platter. 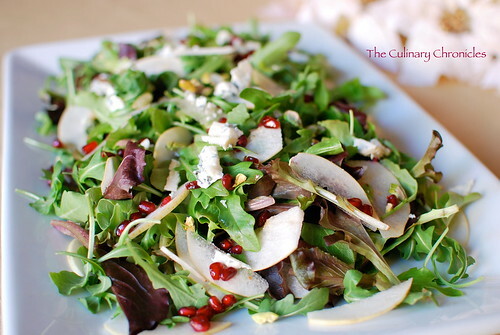 Place the pears over the greens and sprinkle the pomegranate seeds, pistachios, and gorgonzola on top. Drizzle the vinaigrette over the salad and serve immediately.